Nehardea, Sura, Pumbedita, and Maḥuza. Rab Ashi, Founder of the Babylonian Talmud. The Jews of Babylonia, no doubt, shared in the changes and movements that Ezra and his successors, who came from Babylonia, introduced into Palestine. But for the four centuries covering the period from Ezra to Hillel there are no details; and the history of the succeeding two centuries, from Hillel to Judah I., furnishes only a few scanty items on the state of learning among the Babylonian Jews. Sherira Gaon, in his famous letter (the chief source of information on the Babylonian schools) referring to those dark centuries, wrote: "No doubt, here in Babylonia public instruction was given in the Torah; but besides the exilarchs there were no recognized heads of schools until the death of Rabbi [Judah I.]." The principal seat of Babylonian Judaism was Nehardea, where there certainly was some institution of learning. A very ancient synagogue, built, it was believed, by King Jehoiachin, existed in Nehardea. At Huẓal, near Nehardea, there was another synagogue, not far from which could be seen the ruins of Ezra's academy. In the period before Hadrian, Akiba, on his arrival at Nehardea on a mission from the Sanhedrin, entered into a discussion with a resident scholar on a point of matrimonial law (Mishnah Yeb., end). At the same time there was at Nisibis, in northern Mesopotamia, an excellent Jewish college, at the head of which stood Judah ben Betera (Bathyra), and in which many Palestinian scholars found refuge at the time of the persecutions. 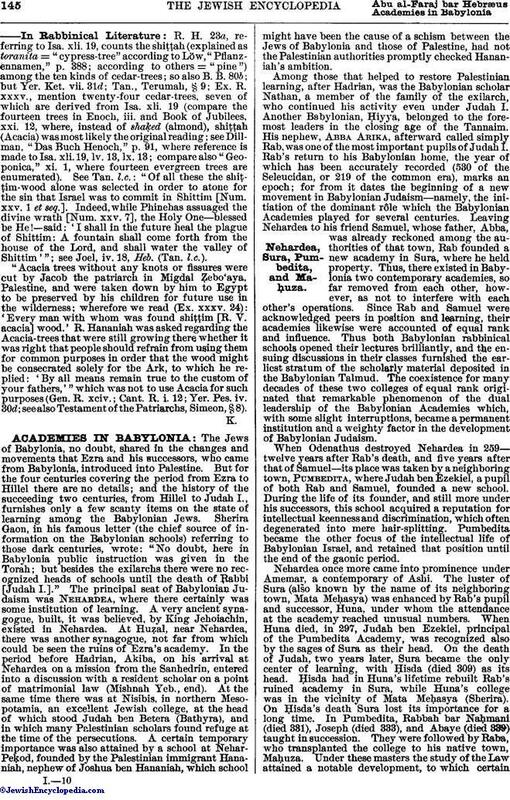 A certain temporary importance was also attained by a school at Nehar-Peḳod, founded by the Palestinian immigrant Hananiah, nephew of Joshua ben Hananiah, which school might have been the cause of a schism between the Jews of Babylonia and those of Palestine, had not the Palestinian authorities promptly checked Hananiah's ambition. Among those that helped to restore Palestinian learning, after Hadrian, was the Babylonian scholar Nathan, a member of the family of the exilarch, who continued his activity even under Judah I. Another Babylonian, Ḥiyya, belonged to the foremost leaders in the closing age of the Tannaim. His nephew, Abba Arika, afterward called simply Rab, was one of the most important pupils of Judah I. Rab's return to his Babylonian home, the year of which has been accurately recorded (530 of the Seleucidan, or 219 of the common era), marks an epoch; for from it dates the beginning of a new movement in Babylonian Judaism—namely, the initiation of the dominant rôle which the Babylonian Academies played for several centuries. Leaving Nehardea to his friend Samuel, whose father, Abba, was already reckoned among the authorities of that town, Rab founded a new academy in Sura, where he held property. Thus, there existed in Babylonia two contemporary academies, so far removed from each other, however, as not to interfere with each other's operations. Since Rab and Samuel were acknowledged peers in position and learning, their academies likewise were accounted of equal rank and influence. Thus both Babylonian rabbinical schools opened their lectures brilliantly, and the ensuing discussions in their classes furnished the earliest stratum of the scholarly material deposited in the Babylonian Talmud. 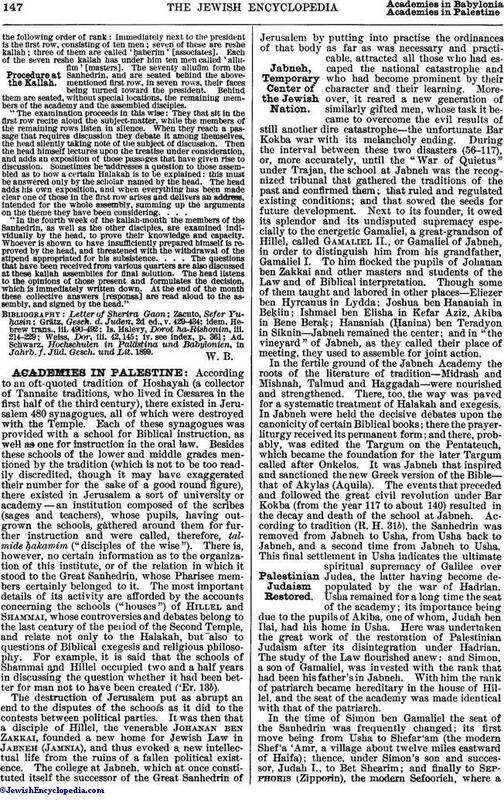 The coexistence for many decades of these two colleges of equal rank originated that remarkable phenomenon of the dual leadership of the Babylonian Academies which, with some slight interruptions, became a permanent institution and a weighty factor in the development of Babylonian Judaism. When Odenathus destroyed Nehardea in 259—twelve years after Rab's death, and five years after that of Samuel—its place was taken by a neighboring town, Pumbedita, where Judah ben Ezekiel, a pupil of both Rab and Samuel, founded a new school. During the life of its founder, and still more under his successors, this school acquired a reputation for intellectual keenness and discrimination, which often degenerated into mere hair-splitting. Pumbedita became the other focus of the intellectual life of Babylonian Israel, and retained that position until the end of the gaonic period. Nehardea once more came into prominence under Amemar, a contemporary of Ashi. The luster of Sura (also known by the name of its neighboring town, Mata Meḥasya) was enhanced by Rab's pupil and successor, Huna, under whom the attendance at the academy reached unusual numbers. When Huna died, in 297, Judah ben Ezekiel, principal of the Pumbedita Academy, was recognized also by the sages of Sura as their head. On the death of Judah, two years later, Sura became the only center of learning, with Ḥisda (died 309) as its head. Ḥisda had in Huna's lifetime rebuilt Rab's ruined academy in Sura, while Huna's college was in the vicinity of Mata Meḥasya (Sherira). On Ḥisda's death Sura lost its importance for a long time. In Pumbedita, Rabbah bar Naḥmani (died 331), Joseph (died 333), and Abaye (died 339) taught in succession. They were followed by Raba, who transplanted the college to his native town, Maḥuza. Under these masters the study of the Law attained a notable development, to which certainPalestinian scholars, driven from their own homes by the persecutions of Roman tyranny, contributed no inconsiderable share. After Raba's death, in 352, Pumbedita regained its former position. The head of the academy was Naḥman bar Isaac (died 356), a pupil of Raba. In his method of teaching may be discerned the first traces of an attempt to edit the enormous mass of material that ultimately formed the Babylonian Talmud. Not Pumbedita, however, but Sura, was destined to be the birthplace of this work. After Raba's death, Papa, another of his pupils, founded a college in Naresh, near Sura, which, for the time being, interfered with the growth of the Sura school; but after Papa's death, in 375, the college at Sura regained its former supremacy. Its restorer was Ashi, under whose guidance, during more than half a century (Ashi died 427), it attained great prominence, and presented such attractions that even the exilarchs came there, in the autumn of each year, to hold their customary official receptions. The school at Pumbedita recognized the preeminence of that of Sura; and this leadership was firmly retained for several centuries. The unusual length of Ashi's activity, his undeniable high standing, his learning, as well as the favorable circumstances of the day, were all of potent influence in furthering the task he undertook; namely, that of sifting and collecting the material accumulated for two centuries by the Babylonian Academies. The final editing of the literary work which this labor produced did not, it is true, take place until somewhat later; but tradition rightly names Ashi as the originator of the Babylonian Talmud. Indeed, Ashi's editorial work received many later additions and amplifications; but the form underwent no material modification. The Babylonian Talmud must be considered the work of the Academy of Sura, because Ashi submitted to each of the semiannual general assemblies of the academy, treatise by treatise, the results of his examination and selection, and invited discussion upon them. His work was continued and perfected, and probably reduced to writing, by succeeding heads of the Sura Academy, who preserved the fruit of his labors in those sad times of persecution which, shortly after his death, were the lot of the Jews of Babylonia. These misfortunes were undoubtedly the immediate cause of the publication of the Talmud as a complete work; and from the Academy of Sura was issued that unique literary effort which was destined to occupy such an extraordinary position in Judaism. Rabina (R. Abina), a teacher in Sura, is considered by tradition the last amora; and the year of his death (812 of the Seleucidan, or 500 of the common era) is considered the date of the close of the Talmud. 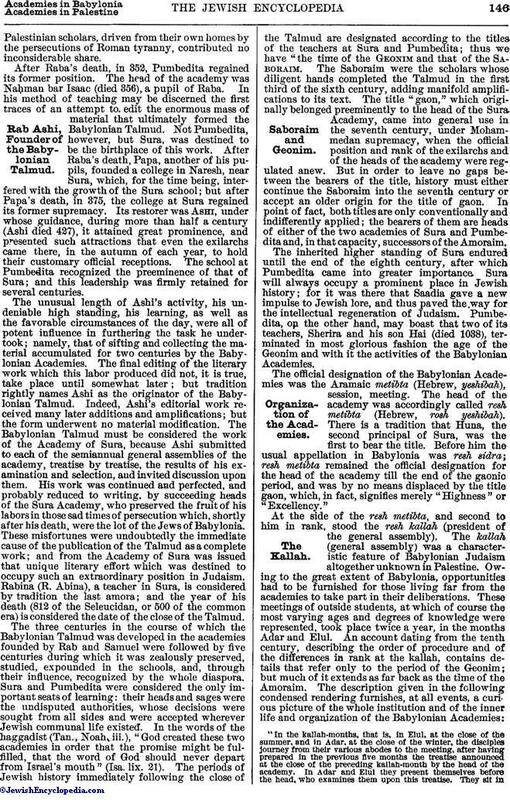 The three centuries in the course of which the Babylonian Talmud was developed in the academies founded by Rab and Samuel were followed by five centuries during which it was zealously preserved, studied, expounded in the schools, and, through their influence, recognized by the whole diaspora. Sura and Pumbedita were considered the only important seats of learning: their heads and sages were the undisputed authorities, whose decisions were sought from all sides and were accepted wherever Jewish communal life existed. In the words of the haggadist (Tan., Noah, iii. ), "God created these two academies in order that the promise might be fulfilled, that the word of God should never depart from Israel's mouth" (Isa. lix. 21). The periods of Jewish history immediately following the close of the Talmud are designated according to the titles of the teachers at Sura and Pumbedita; thus we have "the time of the Geonim and that of the Saboraim. The Saboraim were the scholars whose diligent hands completed the Talmud in the first third of the sixth century, adding manifold amplifications to its text. The title "gaon," which originally belonged preeminently to the head of the Sura Academy, came into general use in the seventh century, under Mohammedan supremacy, when the official position and rank of the exilarchs and of the heads of the academy were regulated anew. But in order to leave no gaps between the bearers of the title, history must either continue the Saboraim into the seventh century or accept an older origin for the title of gaon. In point of fact, both titles are only conventionally and indifferently applied; the bearers of them are heads of either of the two academies of Sura and Pumbedita and, in that capacity, successors of the Amoraim. The inherited higher standing of Sura endured until the end of the eighth century, after which Pumbedita came into greater importance. Sura will always occupy a prominent place in Jewish history; for it was there that Saadia gave a new impulse to Jewish lore, and thus paved the way for the intellectual regeneration of Judaism. Pumbedita, on the other hand, may boast that two of its teachers, Sherira and his son Hai (died 1038), terminated in most glorious fashion the age of the Geonim and with it the activities of the Babylonian Academies. The official designation of the Babylonian Academies was the Aramaic metibta (Hebrew, yeshibah), session, meeting. The head of the academy was accordingly called resh metibta (Hebrew, rosh yeshibah). There is a tradition that Huna, the second principal of Sura, was the first to bear the title. Before him the usual appellation in Babylonia was resh sidra; resh metibta remained the official designation for the head of the academy till the end of the gaonic period, and was by no means displaced by the title gaon, which, in fact, signifies merely "Highness" or "Excellency." "In the kallah-months, that is, in Elul, at the close of the summer, and in Adar, at the close of the winter, the disciples journey from their various abodes to the meeting, after having prepared in the previous five months the treatise announced at the close of the preceding kallah-month by the head of the academy. In Adar and Elul they present themselves before the head, who examines them upon this treatise. They sit inthe following order of rank: Immediately next to the president is the first row, consisting of ten men; seven of these are reshe kallah; three of them are called 'ḥaberim' [associates]. Each of the seven reshe kallah has under him ten men called 'alluflm' [masters]. The seventy alluflm form the Sanhedrin, and are seated behind the above-mentioned first row, in seven rows, their faces being turned toward the president. Behind them are seated, without special locations, the remaining members of the academy and the assembled disciples. "The examination proceeds in this wise: They that sit in the first row recite aloud the subject-matter, while the members of the remaining rows listen in silence. When they reach a passage that requires discussion they debate it among themselves, the head silently taking note of the subject of discussion. Then the head himself lectures upon the treatise under consideration, and adds an exposition of those passages that have given rise to discussion. Sometimes he addresses a question to those assembled as to how a certain Halakah is to be explained: this must be answered only by the scholar named by the head. The head adds his own exposition, and when everything has been made clear one of those in the first row arises and delivers an address, intended for the whole assembly, summing up the arguments on the theme they have been considering. . . .
"In the fourth week of the kallah-month the members of the Sanhedrin, as well as the other disciples, are examined individually by the head, to prove their knowledge and capacity. Whoever is shown to have insufficiently prepared himself is reproved by the head, and threatened with the withdrawal of the stipend appropriated for his subsistence. . . . The questions that have been received from various quarters are also discussed at these kallah assemblies for final solution. The head listens to the opinions of those present and formulates the decision, which is immediately written down. At the end of the month these collective answers [responsa] are read aloud to the assembly, and signed by the head." Ad. Schwarz, Hochschulen in Palästina und Babylonien, in Jahrb. f. Jüd. Gesch. und Lit. 1899.